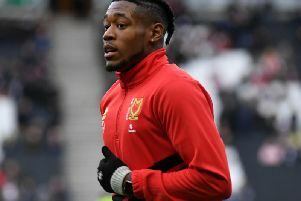 MK Dons player ratings in the 3-1 defeat to Oxford on New Year's Day. Lee Nicholls - 5 - A quiet afternoon on the whole, but his mistake cost Dons their second goal. George Williams - 6 - Did nothing wrong, but didn't sparkle. Ouss Cisse - 5 - Had the beating of Thomas in the air, but made up a shaky defensive unit. Ethan Ebanks-Landell - 5 - Beaten by Obika for pace for Oxford's third. Looked worn out after Saturday's heroics. Scott Golbourne - 6 - Solid enough at left back. Ed Upson - 5 - Tried to do too much fancy stuff when the simple ball was most often the right one. Conor McGrandles - 7 - Another consistent, gritty showing. Took his share of rough tackles, including the red card incident which saw Ricardinho sent off. Alex Gilbey - 8 - Dons' driving force in the centre of the park, looked to get things going. Scored again too. Peter Pawlett - 5 - Showed glimmers of his ability, but they were few and far between. Robbie Muirhead - 7 - After a few range-finders, his crosses were on point and was a real threat down the left. Was sacrificed for Aneke in the second period. Kieran Agard - 5 - Headed wide when he should have at least tested the keeper, but didn't really do much. Chuks Aneke - 6 - Had a few half chances but felt he had to do it all himself.